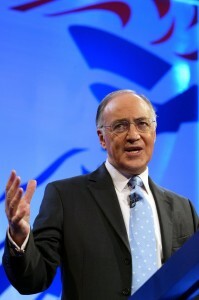 Below is the text of the speech made by the then Leader of the Opposition, Michael Howard, on 7th June 2004 in Bristol. I am delighted to be here in Bristol. Yesterday I was in Normandy commemorating the sixtieth anniversary of the D Day landings with war veterans from across the world. It was the most humbling experience. And it was a great honour to join them in remembering the extraordinary sacrifices that were made sixty years ago. The price they paid for liberty should never be forgotten. Today we are free. But our world remains uncertain and insecure. In such a fast changing environment it is essential that people feel a sense of ownership over, and solidarity with, the institutions which serve them. The institution which can best provide that sense of ownership and solidarity is the nation state. Without a strong and independent state, no modern democracy is possible. The nation state is what binds people together. It gives people a sense of identity. That is why I am so hostile to proposals which would transfer more power from Britain to the European Union. The proposed new European Constitution would mean transferring substantial new powers from the nation states of Europe to the European Union. The EU would have its own criminal code for the first time. Europe would be able to tell Britain how to run our police and courts, what rights criminals should have and how to deal with terrorists. And because the Constitution would incorporate the Charter of Fundamental Rights into EU law, our asylum laws would be affected too. Incorporating the Charter wouldn‘t just affect asylum law, it would give the EU and European Court the power to make new laws about how British businesses are run. The rights under the Charter would put the clock back in Britain by making trade unions more powerful and giving them new rights. It would be up to the European Court to determine exactly what these rights mean in practice. But if past experience is anything to go by, they will lead to yet more burdens on business – burdens British politicians would be powerless to stop. There may well be a case for some of these rights. You don’t have to argue for a free for all to be opposed to more regulation at the European level. You can simply take the view – as I do – that it’s better to argue the issues out here, in Britain, than have them imposed upon us by the majority vote of other countries in Brussels. It is hardly surprising that over 60 per cent of small and medium-sized businesses think the Constitution would be bad for jobs. On top of all this, the EU will have a President and a Foreign Minister to set policy. The EU will have new powers to make treaties with other countries. The European Court could have new powers to review the actions of the British army. So I am totally opposed to the European Constitution. Countries have constitutions and I do not want to be part of a country called Europe. I want to build a Europe of nation states. I do not want to build a nation called Europe. Labour and the Liberal Democrats want to sign up to the Constitution. They would take more powers from Britain and surrender them to Brussels. The Lib Dems want to scrap the pound. They support a European army, European wide taxes, a single European foreign policy, and a European asylum policy. In short, they would sign up to anything that comes out of Brussels. Not that they have admitted it of course during this election campaign. No – they have been deadly quiet about their European policies. Why? Because they know they are out of tune with what the British people want. Tony Blair may claim that he’ll stand up for Britain’s interests. But the reality is rather different. Tony Blair used to oppose a European Constitution. But he’s given in on that. Tony Blair used to oppose the EU having a single legal personality. But he’s given in on that. That’s why, whatever Tony Blair finally agrees, the establishment of a European Constitution is a major strategic defeat for his Government. The truth is when Labour begin negotiating the Constitution next week, they will be fighting a massive damage limitation exercise. The truth is that Labour have let Britain down in Europe. They have totally failed to stand up for British interests. But don’t think that Labour will stop at the European Constitution. They want to go even further in the future. Just three months ago, Labour’s Minister for Europe went to Brussels and signed up to a blueprint for a European state. For a government famous for its publicity machine, this was one piece of news that didn’t make its way into the newspapers and onto the TV. Not surprising perhaps when you consider the content. The document that Labour’s Minister for Europe – Denis MacShane – signed up to calls itself a “political vision for Europe”. It’s not a vision that many people in this country would share. It proposes a radical transfer of power from Britain to Europe. – The surrender of Britain’s seat at the UN Security Council. It looks like a done deal. More power for Europe, less power for Britain. Lots of people think that you can only do business with Europe in one of two ways. Either you’ve got to hand over ever more powers. Or you’ve got to give up altogether. So did Mrs Thatcher. She was told that there was nothing that could be done about the fact that Britain paid more than her fair share of the total EU budget. People said her “you’ll never get our money back from Europe”. Well she wasn’t having that. She said no. And look what happened – Britain got her rebate which is still being paid to this day. People said the same sort of thing to us about the Euro. They told us – “if you don’t join, you won’t survive on your own”. We didn’t accept that. The Conservatives, again, said no. The truth is if you stand up for what you believe in, you can get things done in Europe. Britain should start by saying ‘no’ to the Constitution. Saying ‘no’ doesn’t mean we would have to leave the EU – just as we can say ‘no’ to the Euro without leaving the EU. Saying ‘No’ would send a clear message to Europe: we want to control our lives, here in Britain. We don’t want to be railroaded into handing over yet more power to Brussels. Second, Britain should put forward an alternative vision for Europe, to counter the federalist vision. Conservatives have a clear vision for Europe. It’s a vision that will help safeguard jobs and prosperity. It will put Britain first. We want to create a more flexible Europe. Individual countries should be free to integrate more closely if they want to, so long as they do not force other countries to follow them. And, in the light of experience, we should look at taking back powers from Europe that would be better exercised at a national level here in Britain – and in other countries too. The enlargement of the EU to 25 member states creates huge opportunities for Europe. But it also means we must change and modernise. It is not enough to tinker with the weighting of votes in the European Council, as some people seem to think. Those who say that the way forward is to undermine the voting rights of national governments so that they can be more easily forced into doing things against their will, will not succeed in building a successful and durable partnership among European nations. Dealing with the challenge of an enlarged EU requires a change in attitude. We need a Europe that is built on mutual respect, not mutual suspicion. For Europe to be a success in the 21st century it needs to do less but do things better. That is the Conservative alternative. We will do what we’ve done before. We’ll make clear that not every country in Europe has to sign up to everything that comes out of Europe. Just look at the Euro – some countries are in and some countries are out. And that’s fine. Conservative policy is simple. If some countries want to integrate more closely, let them. But they cannot force Britain to join them if we don’t want to. And we will take back powers from Europe by tough negotiation – just as we did with the rebate. The Conservatives can do all this – we’ve done it before. Britain is a great country. We deserve a government that has the confidence to get the best deal for Britain. Not a government that gives up at the first hint of trouble. No one likes to say no. But sometimes you have to if you’re going to get what you want. Politics isn’t just about being popular – it’s about getting the job done.